“Its secret location as recently revealed to a select group of people who were given permission to explore and film the city. "the Giza-plateau and old Cairo are crisscrossed with subterranean passageways, shafts, natural caverns, lakes and chambers that contain surprising artefacts, but Egyptian authorities are not ready to reveal these to the public"
major elements of Mystery School teachings developed, What happened under the sands thousands of years ago is not reflected in today's history books, and discoveries made in the last eight decades or so verify that point. height, with great carved figures of animals on it and an underground passage by which it can be entered. I was told very credibly that underground chambers and passages connected this pyramid with the pyramids at Memphis. The pyramids at Memphis were the pyramids at Giza, for Giza was originally called Memphis (see reference, "Giza formerly Memphis" on Nordan's map from Travels in Egypt and Nubia, 1757, on page 152 of previous chapter). public respect, and a sort of religious fear maintained its inviolability better than armed protection would have done. In the belly of the Sphinx were cut out galleries leading to the subterranean part of the Great Pyramid. These galleries were so art-fully crisscrossed along their course to the Pyramid that, in setting forth into the passage without a guide throughout this network, one ceasingly and inevitably returned to the starting point. then its symbolism was most appropriate. Sphinx are secret chambers holding treasures or magical objects. Inscriptions which the ancients asserted were engraved on the walls of certain underground galleries and passageswere constructed deep in the dark interior to preserve ancient wisdom from being lost in the flood. pyramid. His friends perceived that he was enchanted. Ahmed Ben Touloun expressed a desire to see the goblet of glass. one's intelligence...but still I have seen them". In the same century , another writer, Muterdi, gave an account of a bizarre incident in a narrow passage under Giza, where a group of people were horrified to see one of their party crushed to death by a stone door that, by itself, suddenly slid out from the face of the passageway and closed the corridor in front of them. Herodotus said Egyptian priests recited to him their long-held tradition of "the forma-tion of underground apartments" by the original developers of Memphis. The most ancient inscriptions therefore suggested that there existed some sort of extensive chamber system below the surf'i.ce of the areas sur-rounding the Sphinx and pyramids. 1993. That detection was publicly acknowledged in a documentary called The Mystery of the Sphinx, screened to an audience of 30 million people on NBC TV later that year. passage leading deep into the body of the mysterious monument. The Giza Antiquities chief, Mr Zahi Hawass, said there was no dispute the tunnel was very old. However, what is puzzling is: who built the passage? of books full of secret knowledge. each other, above and below the ground. ing system was launched at the begin-ning of 1998 and the location of 27 unexcavated sites in five areas was precisely determined. Nine of those sites are on Luxor's east bank and the others are in Giza, Abu Rawash, Saqqara and Dashur. The printouts of the Giza area show an almost incomprehensible mass of net-like tunnels and chambers crisscrossing the area, intersecting and entwining each other like latticework extending out across the entire plateau. With the space surveillance project, Egyptologists are able to determine the location of a major site, its probable entrance and the size of chambers before starting excavations. Particular attention is being focused on three secret locations: an area in the desert a few hundred metres west/southwest of the original location of the Black Pyramid, around which is currently being built a massive system of con- crete walls seven metres high covering eight square kilometres; the ancient highway that linked the Luxor temple with Karnak; and the "Way of Horus" across northern Sinai. ally and in various stages via underground passageways . represented by the now-called King's Chamber . magazine article, written and published in 1935 by Hamilton M.
than 125 feet, with roomy courts and side chambers . The underground connector complex was originally built between the Great pyramid and the Temple of the Solarmen, for the Pyramid of Khephren was a later and superficial structure. The subway and its apartments were exca-vated out of solid, living bedrock-a truly extraordinary feat, considering it was built thousands of years ago. There is more to the story of under-ground chambers at Giza, for media reports described the unearthing of a subterranean passageway between the Temple of the Solar-men on the plateau and the Temple of the Sphinx in the valley. That passageway had been unearthed a few years before the release and publication of that particular newspaper article. The discoveries led Dr Selim Hassan and others to believe and publicly state that, while the age of the Sphinx was always enigmatic in the past, it may have been part of the great architectural plan that was deliberately arranged and carried out in association with the erection of the Great Pyramid. Archaeologists made another major discovery at that time. Around halfway between the Sphinx and Khephren's Pyramid were discovered four enormous vertical shafts, each around eight feet square, leading straight down through solid limestone. It is called "Campbell's Tomb" on the Masonic and Rosicrucian plans, and "that shaft complex", said Dr Selim Hassan, "ended in a spacious room, in the centre of which was another shaft that descend-ed to a roomy court flanked with seven side chambers ". Some of the chambers contained huge, sealed sarcophagi of basalt and granite, 18 feet high. The discovery went further and found that in one of the seven rooms there was yet a third vertical shaft, dropping down deeply to a much lower chamber. At the time of its discovery , it was flooded with water that partly covered a solitary white sarcophagus. every detail of the face . the sands, all interconnected by secret and ornate passageways. triangular-shaped tablet of gold bearing upon it the absolute name of the Deity (God). just east of the Great Pyramid. Lewis recorded that he was "deeply impressed" with the images. that stunned the world and attracted international media coverage. 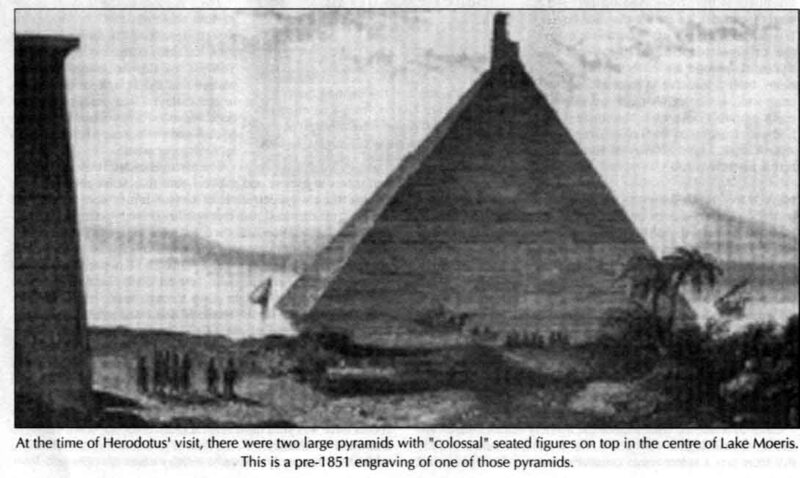 Picture-txt: At the time of Herodotus' visit, there were two large pyramids with "colossal" seated figures on top in the centre of Lake Moeris. This is a pre-1851 engraving of one of those pyramids. the discovery is: where is that city today? the cavern below the bedrock of the River Nile. up to the basement of the Coptic Church in old Cairo (Babylon). Drawing from narra-tives of people "living in the Earth" given in the books of Genesis, Jasher and Enoch, it is possible that the city was originally called Gigal. footage to the general public, but for some reason it was withheld. and was recently sent to NASA in the USA for analysis. complex is carefully and specifically thought out. surveillance techniques, the records and traditions of the ancient Egyptian mystery schools that claim to preserve secret knowlege of the Giza Plateau all rose to the highest degree of acceptability. anything of the kind except the one temple adjoining the Sphinx. was no temple adjoining the Sphinx. adjoining the Sphinx was discovered in the sand and eventually opened to the public. On matters outside official policy, there appears to be a hidden level of censorship in operation, one designed to protect both Eastern and Western religions. unmapped territory. 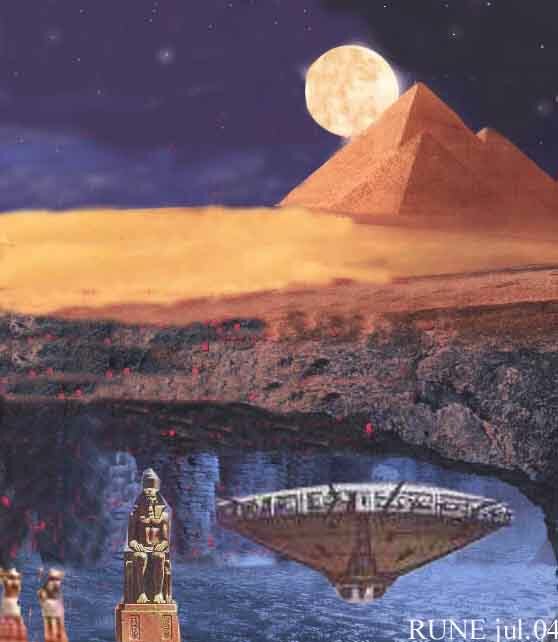 It is not possible, then, to say precisely how miles of underground passageways and chambers beneath the Giza Plateau were lit, but one thing is for sure: unless the ancients could see in the dark, the vast subterranean areas were somehow illuminated. The same question is addressed of the interior of the Great Pyramid, and Egyptologists have agreed that flaming torches were not used, for ceilings had not been black-ened with residual smoke. sible for lighting the subterranean areas of their complexes. who would some day return to make them work once again. ture reproductions made in terracotta were buried with the dead. indefinitely then at least for considerable periods of time. but also in other parts of the world. galleries under the Great Pyramid. A 17th-century account recorded another story about a robot. report said that it had been for a considerable number of years. Picture-txt: This is how the unearthing of a lost city was reported in one of many papers, the Sunday Express of 7 July 1935. 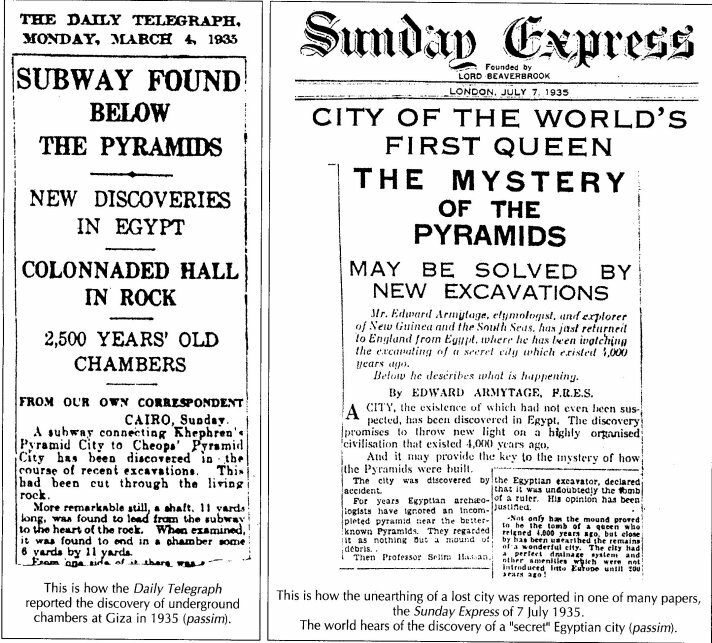 The world hears of the discovery of a "secret" Egyptian city (1935)(passim). short extract: " ...One sequence of pictures showed a group of thoughtful men planning what they termed a "Time Capsule" (what we called "The Cave of the Ancients"), wherein they could store for later generations working models of their machines and a complete, pictorial record of their culture and lack of it. Immense machines excavated the living rock. Hordes of men installed the models and the machines. We saw the cold light spheres hoisted in place, inert radio-active substances giving off light for millions of years. Inert in that it could not harm humans, active in that the light would continue almost until the end of Time itself. NEXUS offices and the Joshua Books. the pleiadian contact-person (not channeled) SEMJASE and ASKET told Meier similar - that the pyramids are only the top of big "cities" deep below - some of the contactnotes of Semjase translated to Swedish/Norwegian. English semjasesite. More Erra/Pleiaren info in english in the book UFOCONTACT FROM THE PLEIADES. "what do they hide on Giza?"